Gun turrets are defensive structures and are the first automatic defense to be unlocked. They use magazines for ammunition which can be refilled manually or by inserters. Unlike laser turrets, they do not require power and can operate practically anywhere as long as they have sufficient ammunition. On the downside, this means that ammo must be periodically replenished. Without upgrades, the gun turret has the same fire rate as the man-portable submachine gun, doing equal damage per second. The gun turret receives bonuses from technologies that improve bullets so it keeps pace with the submachine gun as those improve, and they also receive bonuses from their own damage upgrade, potentially giving the turret a much higher DPS. These two infinitely-researchable damage effects stack multiplicatively. Recipe is 2× more expensive. 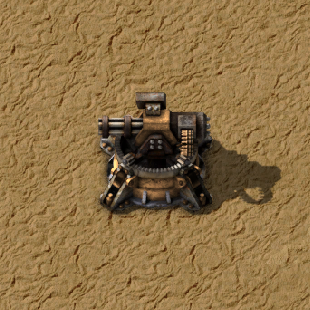 Maximum of 10 Firearm magazines can be put into the turret by inserters. Range extended from 15 to 17. Warning for ammo-less turret is shown. This page was last edited on 22 March 2019, at 16:29.